Located atop Warm Springs Mountain on 27+ acres at an elevation of 3,800' with views for 60 miles, this rustic wood-sided custom home contains a total of 2,866 sq. ft. of living space on two levels, with a 1,900 sq. ft. basement, 956 sq. ft. of which is finished. The home, built in 1988, is situated on a level portion of the mountaintop with an open pasture just outside the front door. Thick forest cover surrounds the pasture and home. The gravel drive with entry gate off Airport Road winds its way up the hillside and is paved as it approaches the house. The inviting 2-story living room features a stone fireplace with wood stove insert. The modern kitchen features stainless steel appliances with an adjoining pantry with extensive storage. The dining area adjoins the kitchen with southern valley views of the distant mountains. Upstairs there is a private master suite with generous closet space and a private bath with separate shower and spa soaking tub. On the main floor there are 3 additional bedrooms, one and a half baths as well as an office with a separate entrance off the back. There is a large 2-stall barn in the southern pasture in front of the house as well as a tool and equipment shed, wood shed and playhouse on the eastern side. The partially finished basement features a large gaming area as well as a family room with fireplace. A utility room with pet bath, large workshop and single car garage are also located here. This home has a private well with a 1,000 gallon holding tank and private septic system. Wildlife abounds with deer, turkey and bear that often visit the property. Quiet, privacy and solitude make this the perfect vacation/second home or year round residence, high in the Allegheny Mountains of Virginia. Dining/Kitchen with Stainless Steel Appliances, Serving Bar and cooking Fireplace. Breakfast Area/Office just off Kitchen with access to Rear Deck and Fenced Play Yard. Single Car Garage can be accessed from inside the house. Main Floor and Second Floor totals 2,866 sq. 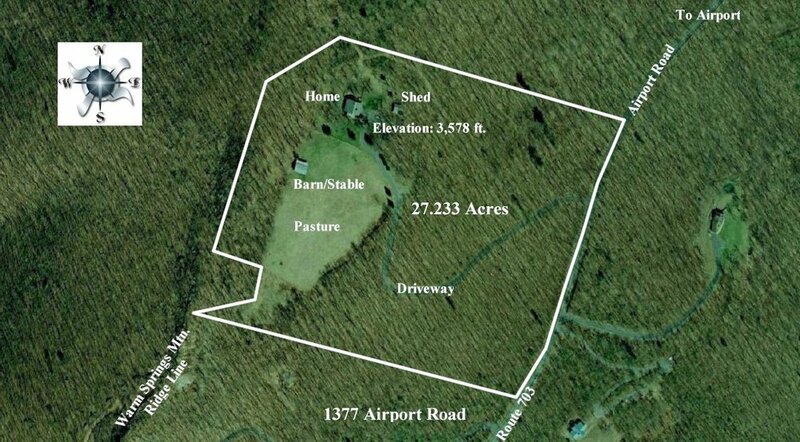 ft.
Total of 27.25 acres: 21.96 Acres in Bath County and 5.29 in Alleghany County, all contiguous. 2018 annual property taxes are $1,962. Twenty minutes to Hot Springs, 5 minutes to Airport.